A Parisian Sultana, written by Adolphe Belot, is set in 1872 and 1873, is about Laura de Guéran, a wealthy young widow living in Paris. She is 25 years old, of average height, “admirably proportioned…fair, decidedly fair” with a “well turned neck,” a “full, though not too full bust;” her “whole countenance is a strange mixture of good nature and firmness, of amiability and resolution, of gaiety and sadness.” De Guéran is the daughter of a member of the Royal Geographical Society and as a child and teenager she knew “most of the celebrated travelers of our age,” including Overweg, Speke, Richardson, Vogel, and Schweinfurth. When she turned 22 she fell in love with and married the wealthy French explorer the Baron de Guéran, and moved with him to Paris. Although English by birth she quickly fell in love with Paris and the French and became a French patriot. With her husband she enjoyed two years of married bliss. Then he disappeared, somewhere in Egypt, and she was notified that he was dead. After a year’s mourning she summons three men to her apartment; the three are in love with her and have all proposed marriage to her. She tells them that she is going to Africa to find her husband’s remains and to see where he fell and why and to “publish his works,” and that the three should come with her. One of the men, a doctor, declines on the grounds that his mother is dying and he must stay with her. This is hard for him, because he clearly loves her, and she is genuinely sorry that he is not accompanying her. The other two agree, and together with an older doctor and a reliable female Cockney maid/companion they go to Africa. A Parisian Sultana follows their travels through Saharan Africa and the adventures they have there. They encounter enemy tribes, rampaging elephants, and slavers, and survive abandonment by their native guides. After Laura and her friends discover that Laura’s husband might still be alive in a country on the southeast coast of Africa, they trek there, picking up an army of native warriors on the way (their king falls in love with Laura and is persuaded to accompany her south). They eventually find the Baron, who has been made the lover/prisoner of the beautiful, powerful, and majestic queen Walinda, a “black Venus” in charge of a great army of ferocious Amazon warriors. Laura’s forces defeat Walinda’s army in pitched battle. The Baron attempts to escape from Walinda, but she falls on him with her spiked armor and badly wounds him. Walinda is captured by Laura. Walinda tries to kill Laura, to regain the Baron (who she is in love with), but she kills the Baron instead and then drowns herself out of grief. The group returns to Paris and Laura marries the doctor, who after the death of his mother travels into Africa to find Laura. A Parisian Sultana is both a well-informed travelogue through Saharan and sub-Saharan Africa and an entertaining and well-written adventure and romance novel with Lost Race elements. 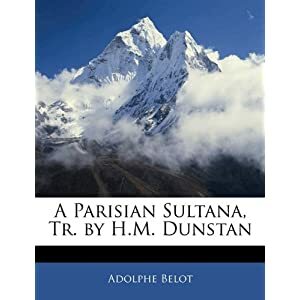 Adolphe Belot had clearly traveled through Africa and knew well the areas he wrote about in AA Parisian Sultana ; his descriptions are memorable, especially of urban Cairo and rural Egypt. Moreover, Belot is progressive in his portrayal of Africans. He is refreshingly free of racism, and he treats the African tribes and characters with respect. Belot is also vehemently anti-slavery and gives a grueling description of the conditions on a slave ship on the Nile. But the main attraction of the novel is the character of Laura de Guéran herself. She is resolute, well-spoken, confident but not arrogant or vain, sensible, fearless, kind, calm and self-possessed. She speaks several languages, is an experienced traveler and is scientifically aware. Like Belot, she is not a racist but treats everyone with respect, from porters to kings and queens.